The Endangered Species Memory Game challenges kids' minds while teaching them fascinating facts about some of the world's endangered species. 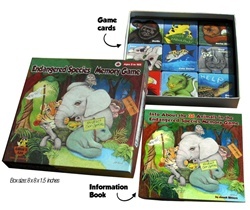 Included are 72 cards (36 different species x 2) and an Information Book. The cards are brilliantly colourful and feature sensitively hand rendered drawings of some of the world’s endangered species by renowned artist, Anouk Bikkers. 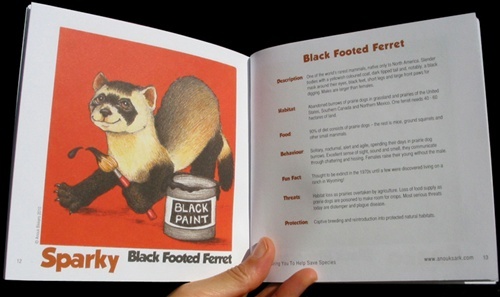 The book teaches about 36 different species: their names, descriptions, habitats, food, fun facts, behaviours, threats and protection measures. 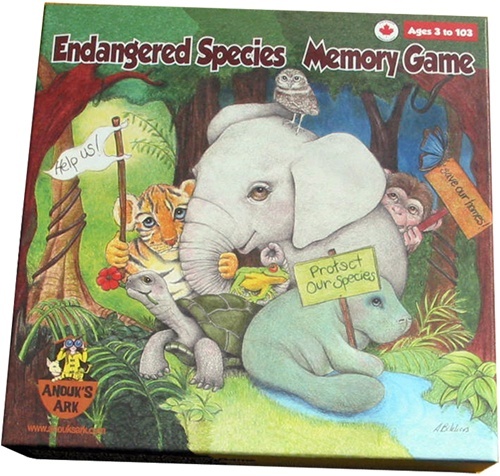 The objective of the game is to match the Endangered Species cards. The player with the most pairs wins the game. Through education and play, children can learn how to protect the life of our planet. Sidenote: my kids and I love this game! We play it at least 1 hour every day. Seriously. It's great fun and the quality of the artwork is really incredible. Good for ages 3 - 103. Anouk’s Ark products are made with a minimal impact on the environment. They are manufactured in Toronto, Canada from recycled materials, Forest Stewardship Council ( FSC ) certified papers, and vegetable-based inks. Anouk’s Ark was founded in Canada out of Anouk's desire to raise awareness about endangered species. Her aim is to awaken compassion for our planet and all the diverse life forms it supports. Anouk herself is the artist. Note: Anouk’s Ark is a member of 1% for the Planet: an alliance of businesses that donate at least 1% of their annual revenues to environmental organizations worldwide.